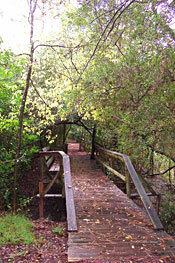 Welcome to the Edith Moore Nature Sanctuary, home of the Houston Audubon Society. Our sanctuary is an 18-acre oasis of native Texas forest, surrounded by Houston's busy Memorial area. The volunteers of the Audubon Docent Guild provide guided natural history tours of the Sanctuary for all interested groups - school classes, scout troops, garden clubs, etc. 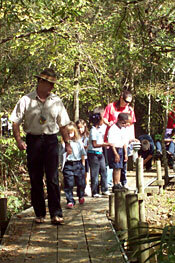 Standard field trips last 1.5 hour, and longer programs are available if requested in advance. For more information and to schedule a tour, please contact docent@houstonaudubon.org.